How We Test Smoke Alarms - Which? To uncover the Best Buy smoke alarms that you can trust, we put every smoke alarm we review to the test against four different types of fire. And for heat alarms - which detect rapid temperature rises - we run five heat detection tests to check how well they work. 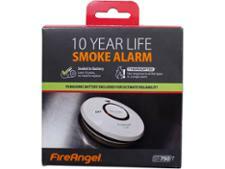 Our video above shows how a Best Buy smoke alarm will make a real, practical difference to you. Read on for more on our tests and how we uncover the smoke alarms you can trust. We put the alarms through independent and rigorous tests in accordance with the British Standard. Our four fires in a specially designed test room represent the extremes you could face – from a cigarette smouldering on a sofa to a chip-pan fire. Our reviews answer the most crucial questions about smoke alarms. 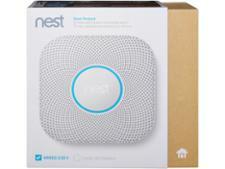 Will this smoke alarm go off in every fire? How quickly will my smoke alarm sound? Can slow smoke alarms still pass official smoke alarm tests? Is it loud enough to wake my family? Is the light bright enough to be seen in smoke? Will it cause nuisance alarms? Is it simple to install and maintain? Find out which models give top-class results in our smoke alarm reviews. Our smoke alarm tests are designed to put smoke alarms through all the extremes they could be exposed to in a normal house fire. The fires include a smouldering wood fire, a smouldering cotton fire, a flaming liquid fire, and a flaming plastics fire. A house fire is usually made up of more than one type of fire, so it's important that an alarm can respond to every type. Our reviews show the actual response times recorded in our tests, so you can clearly see which smoke alarms sound the quickest. And our tests show that the worst smoke alarms we’ve tested can take more than twice as long to trigger as the fastest. The best alarm we tested was more than four minutes quicker to sound than the slowest in our smouldering-wood fire test. In our test involving smouldering wood, two samples of two smoke alarms took more than nine-and-a-half minutes to trigger. The best alarm we tested was more than four minutes quicker to sound with the same type of fire. Smoke alarms that sound more rapidly when rooms were less smoky received higher scores in our tests, smoke alarms that are slow won’t become Best Buy smoke alarms. Alarms that fail to detect smoke in our tests and don’t sound the alarm will become Don’t Buy smoke alarms. Which? smoke alarm tests have revealed a repeated pattern of safe-seeming products having wildly varying response times. But according to the official safety testing method – which measures the amount and thickness of smoke that is required to trigger the alarm – these products can all be classified as meeting the BS EN 14604 standard. We don’t think this is good enough and that’s why we penalise the alarms that take too long to sound and why only the fastest go on to become Best Buy smoke alarms. There needs to be a stricter new standard that only rewards the alarms that sound more quickly. We’ve raised our response-time concerns with BSI, which said that a new smoke alarms standard is being drafted. We’ll take a close look at it and make our feelings known if it doesn’t go far enough to protect people when there’s a fire. One minute might not sound like a lot, but if your home is on fire it could make all the difference in getting out safely. That’s why we’re tough on smoke alarms that take too long to sound in our tests or, in the case of Don’t Buy smoke alarms, sometimes fail to sound at all. So it’s critical to find one that can not only be relied upon to alert you to a fire, but does this quickly. The above images, supplied by the Fire Brigades Union, show fire spreading quickly around a living room and why it’s so important to install alarms that don’t take too long to sound. The first image shows a house fire after one minute – the sofa is clearly alight with flames licking up the back. After 90 seconds, the fire is significantly larger with a plume of smoke rising, and after two minutes it’s spread right around, with smoke filling the room. The smoke alarms are also tested in a soundproofed (fully anechoic) chamber, to ensure they’re loud enough to wake your family in time to escape a fire. This sound chamber absorbs all sound from the outside world so we can accurately measure the exact decibel output when the smoke detector sounds. 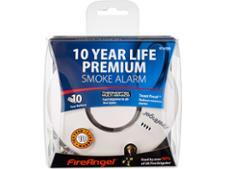 Only the fastest and clearest models earn our recommendation as Best Buy smoke alarms. We highlight the worst as Don't Buy smoke alarms that we think you should avoid. Where the smoke detectors on test had escape lights, we tested their visibility in smoke from 10 metres away. You wouldn't expect the lights on your smoke alarm to illuminate the room, but they should help orientate you in smoky conditions. And we’ve included ‘nuisance alarm’ tests – such as burning toast and steam from a shower – to see how the alarms respond, as these are the situations that encourage people to disable their alarms. We test how easy it is perform the basics to get your smoke alarm up and running - such as installing it, and changing the battery. These essential tasks form our ease-of-use score. Heat alarms work differently to smoke alarms in how they detect fires. Rather than looking for smoke particles in the air, a heat alarm is designed to respond to rapid rises in temperature that happen when a fire starts. This makes them ideal for kitchens, where fires can start easily, but where you wouldn’t site a smoke alarm because of smoke from cooking. We’ve tested a range of smoke alarms from manufacturers including Aico, FireAngel, Honeywell and Konig in a number of different heat detection scenarios. We test heat alarms in five different heat detection scenarios and we carry out our tests to extracts from the British Standard. By testing in a variety of rising temperature situations, we can be confident that when a product passes all of our tests that it will do a reliable job of detecting heat from fires in your home. These are the heat detection tests we run on each heat alarm we test. Directional dependence test - Our measure of whether an alarm’s ability to detect rises in temperature is affected by the direction it points in. Some heat alarms will be better at detecting heat when their sensors are pointing in a certain direction. Slow temperature test - This test measures each alarms responsiveness with slow temperature rises. In our tests we raise the temperature by 1°C per minute until the maximum temperature is reached. Typical temperature test - We measure whether alarms operate and respond correctly over a range of temperature rises between 1°C and 30°C per minute. High temperature test - We check whether the alarm is able to function correctly at high temperatures when the temperature begins to rapidly rise. Reproducibility test - We repeat our tests to check whether the alarms continue to respond to rises in room temperature correctly every time. Battery test - We check whether the alarm sounds to let you know when the battery is running low. Only applicable to heat alarms. Sound output test - We measure how loud the alarms are initially when they sound and then again after they have been sounding for a few minutes. Only applicable to heat alarms. All the assessments listed above go into making the final overall score for each smoke alarm we review. And because some factors are more important than others, they carry different weights in our calculations. A model has to achieve 78% or more to earn our Best Buy recommendation. Anything scoring 45% or less or any alarm that fails any of our fire tests will become a Don't Buy. We run strict pass / fail tests on heat alarms and we don't award test scores. But heat alarms tested need to pass every one of our heat detection tests to become Best Buys. If a product is marginally too quiet, by one or two dB, but passes all of our heat detection tests, we won't recommend it. Products that fail any of our heat detection tests are Don't Buys.